The first question most potential buyers ask us is, “how do I know what I can afford?” So in the interest of helping you frame your search, we’ve put together a chart of the general income requirements for various price points. Some assumptions here: we’re assuming a down payment of 5% and a debt-to-income ratio of 28%, the minimum for a conventional loan. We used a mortgage rate of 4.5%, a good estimate of the going rate at the time of this post. As of February 2017, the median home price for a single family house in the Dallas/Ft. Worth metroplex was $234,000. 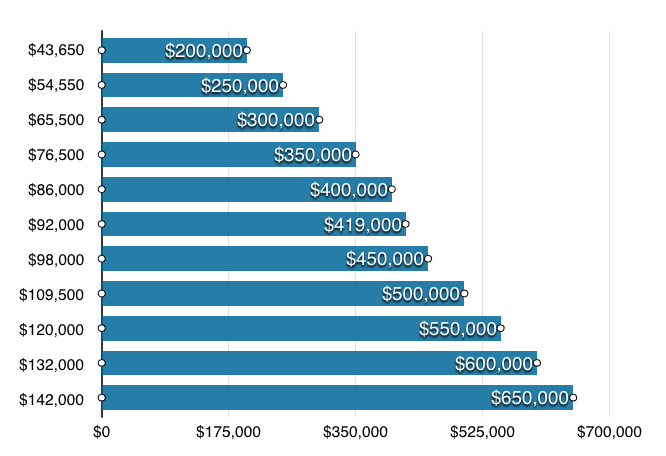 According to our chart, you will need a household income of roughly $55,000 to purchase. Income is the vertical column on the left. Home prices are represented by the blue horizontal bars. Quick disclaimers: Each person or families’ financial situation is unique and will determine the actual amount and terms of a loan. There are no guarantees made here for any actual outcome of the mortgage or home buying process. As they say, your mileage may vary. This article is intended to provide approximations for informational purposes only. A licensed DJR Realtor can help you with the home buying process suitable for your unique needs and situation.